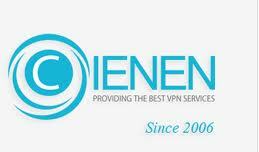 Cienen is a well-established VPN service offered by a company based in the US that was launched in 2006. With its servers located in 5 countries across the world, this service is offered with an interesting set of protocols for the security of user data. A detailed analysis of the features of this VPN service is provided in the review below, which will help you decide on the reliability of this service. There are two packages that this service is offered with, which include a dedicated IP service and a Shared IP service. The service with a shared IP address feature is offered at a monthly cost of $9.95, which is offered at discounted prices for longer subscription terms. This service is available at a cost of $29.85 for a 3-month subscription, $59.70 for a semiannual subscription, $119.40 for an annual subscription and at costs of $238.80 & $358.20 for a period of 2 & 3 years respectively. The dedicated IP service is available with same terms and is offered at a monthly cost of $14.95, where the 3-month subscription is available at $44.85. The semiannual and annual plans are priced at $89.70 and $179.40, while plans for 2- and 3-year subscription terms are offered at $358.80 and $538.20. There is a free trial offered by this service, which is restricted to users from certain countries only, while a money back policy is available for those unhappy with their service. Different protocols used by this company for providing a security to the users of its VPN service include PPTP, SSTP & L2TP. All the connections are encryption with encryption strength of 128-bits that is fair enough to provide a satisfying security. This security is aimed at the security of personal and financial data of the users on public or other vulnerable Wi-Fi hotspots. In terms of privacy, the company maintains connection logs, which are only shared with a third party, when forced by law. This VPN service is offered with a support to all the major OS available in the world like Windows, Mac, Linux, Android & iOS. There is client software available for the users of this service, where a dedicated client setup is maintained and provided for Windows based users. With this service, a user can connect up to 7 devices simultaneously with a single VPN account, using the Shared IP service. Cienen boasts of a 24*7*365 support service for its customers that is offered by different modes of communication. Various options available for customers to get a support regarding any of their queries include a live chat feature, email based support and a helpline number for support on phone. However, email and phone based support options are available during business hours only, where email based service offers the fastest response to all the queries. It offers a reliable service with interesting pricing plans available differently for dedicated and shared IP users.